Beautiful villa with pool 10 km from Siena. The villa, nestled in the protected park of Montagnola, is surrounded by a beautiful scenery of an English grove with tall trees such as holm oaks, cypresses, pines with paths crossing the 50 hectare estate. Adjacent to the villa a wonderful pool with gazebo of 7.5x15 m. Depth ranges from a minimum of 1 meter up to a maximum of 2.5 meters. It is surrounded by olive trees where silence, tranquility and peace make it their strength. The edge of the tub is paved with brick that blends harmoniously with the exterior of the dwelling and with the surrounding landscape. Fully fenced is furnished in the solarium area with tables, chairs, umbrellas, sun loungers, outdoor shower and free WI-FI internet access. The chalet stands on two floors. The main entrance, on the ground floor, leads to the dining room with walls and stone fireplace and to the fitted kitchen to form a single open-space environment. From here you can access a furnished terrace with table and chairs where you can enjoy dinners and barbecues. To the left of the entrance is a bathroom with shower. Going down two steps we find a double room, bathroom with bathtub, lounge area with fireplace and double sofa bed and patio door with access to the garden, laundry area. A travertine staircase leads to the first floor where we find a beautiful double bedroom with canopy bed and small bathroom only with sink with wonderful view of the pool and garden of the villa. The interiors are comfortably furnished with precious furnishings and reflect the typical Tuscan architecture with beamed ceilings in the large room, terracotta floors and white or stone walls. All windows are equipped with mosquito nets. It has private fenced and illuminated parking. The owner lives in the master villa Patrizia who will be happy to welcome you and give their availability for every need. Dirt road access for approx. 1600 m.
The geographical position of Villa Bellaria is a great starting point for discovering Siena, the precious tourist resorts in the area of ​​Monteriggioni, San Gimignano, Montepulciano, Pienza, Montalcino and the picturesque villages of Chianti. The freeway, a few kilometers away, also allows you to easily reach Arezzo, Cortona and other Tuscan art cities such as Florence, Volterra, Lucca and Pisa. Possibility of organizing horse rides. Possibility to book bicycles. Reservations must be made at least ten days in advance. 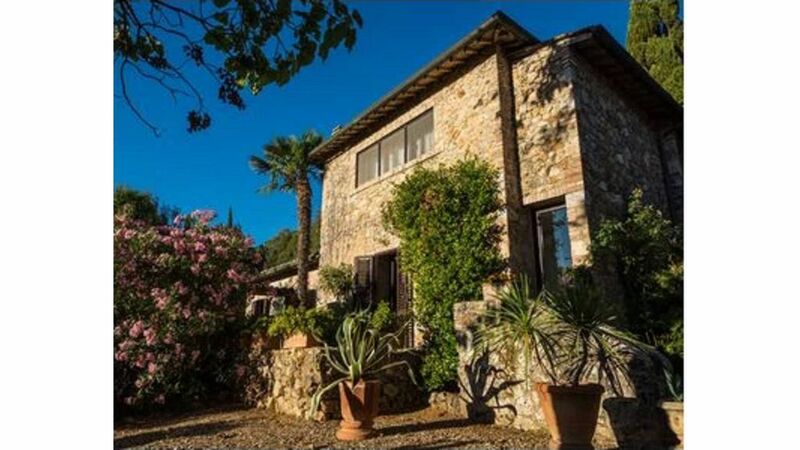 The property was beautiful and in a location convenient for sightseeing throughout Tuscana. The owner was wonderful, very helpful and loving. The villa was comfortable with wonderful fireplaces & lots of wood! Nous avons passé 2 semaines agréables dans cette charmante location proche de Sienne.La villa est parfaitement équipée et l'accueil chaleureux.Belle piscine aux dimensions généreuses. Great place to rest and explore Tuscany. Beautiful tuscany's style house with great garden and clean, big pool. A lot of place for rest outside, having a meal and chilli out. Very good organized with friendly, helpful hosts. Well situated 8km grom Siena. We were on 6 persona on complete and we spent a very good time. Worth to stary there. We recommend this place! Thanks for your review. it is very important for us that our guests spend unforgettable holidays in Villa Bellaria, in the heart of Tuscany, feeling at home away from home. Sehr ruhig gelegenes Haus, das sehr schön in die toskanische Landschaft eingebetet ist. We (a family of 7) had a very pleasant time at Patrizias Villa from the very first moment. The kids and the adults loved the pool, the spacious property and the silence. Siena is a 20-25 min car-ride. All the other top-spots (Florence, San Gimignano etc) are about an hour. This place is great if you are looking to explore and relax. But of course: a car is needed. The property is on a small hill, surrounded by olive-trees and small forests. Also great for hiking-trips. The pool is big enough for real swimming (15m/50ft) and has sufficiently space to chill. Patrizia -the owner who lives next door- was very kind, helpful and discrete. We thank her and her son Eduardo for their very kind and warm hospitality. We would love to come back! Patrizia de Felici, her family and the Bellaria Estate have made our first visit ever in Tuscan area an unforgettable one. Warm receipt, gentle hospitality and a stunning estate with likewise views ( and pool!) were the ingredients for a perfect stay. Close by are many typical villages with a wide variety of restaurants and sales of local produce and historic cities as Siena and Florence for the bright and rich Tuscan history. And when your even invited to join your hosts' birthday celebration you can say that no effort was saved to make you feel at home! Thank you Patrizia, Rudi and family and hope to see you again soon! Lieuwe & Karin, Julia, Floris & Maarten. Siena is waiting for visitors to offer them an exciting and unforgettable experience. No other city keeps alive the cultural and civil heritage of the Middle Ages as Siena, with the Palio and the 17 Contrade with its art masterpieces and the historical center similar to a widespread museum. Siena organizes about 600 events every year, of extraordinarily high quality such as summer music festivals and big exhibitions. In Siena also handicrafts, cooking, gastronomy and wines reach excellence and bring a message of culture and tradition. This is Siena, the capital of Gothic, which, since 1995, is part of the UNESCO World Heritage Site. La piscina sarà aperta dal 11/05/2019 al 05/10/2019 con orario 8,30 fino alle 20,00. Deve essere osservato il regolamento piscina in base alla legge Regione Toscana 9 marzo 2016 n.8 Si accettano animali solo dopo il consenso scritto € 10,00 al giorno . Lavatrice a pagamento. Telo piscina a disposizione su richiesta a pagamento. Lettino/seggiolone gratis su prenotazione. Riscaldamento a consumo con prezzi in vigore al momento del soggiorno circa € 1,30 m3 Legna € 25,00/100 Kg Gli ospiti devono essere registrati il primo giorno di arrivo. Il numero degli ospiti indicato nella prenotazione non deve essere superato.